In the most recent edition of our magazine, Thinking Minnesota, I have an article on 1968 and its political legacy in the United States. I talk a bit about the student unrest at the time, notably the protests against the Vietnam War. But elsewhere in 1968 the struggle was very real indeed. In Czechoslovakia in January that year, Alexander Dubček, the country’s newly elected leader, enacted pro-democracy reforms, loosening state control and expanding individual rights. This was the ‘Prague Spring’ which the uprisings in the middle east a few years ago were fancifully named after. But Czechoslovakia was a communist country, under the control of the Soviet Union. The Soviet leaders opposed Dubček’s reforms and summoned Czechoslovakia’s leaders to Moscow for discussions. As The Atlantic reports in an excellent photo gallery, fifty years ago this week the Soviets did to Czechoslovakia what they had done to Hungary in 1956. By late summer, the talks were not going the way the Kremlin had wanted, so more than 2,000 tanks and thousands more Warsaw Pact troops were sent to invade and occupy the country on August 21. In the first weeks, occupying soldiers were met with protests and limited resistance, and more than 70 civilians were killed in the conflicts. Within the following year, resistance faded, Dubček was removed from office, his reforms were undone, and a more Soviet-controlled government was installed. On August 26th, five days after the Soviet invasion of Czechoslovakia, protesters gathered in Chicago to demonstrate the Democratic convention. Waving communist flags, these mostly middle class kids claimed to be living in a fascist state. One wonders what the Czechs would have made of that. In my Thinking Minnesota article, I argue that the true legacy of 1968 for American politics was the rise of Ronald Reagan. And, in that sense, perhaps 1968 was also a key date in Czechoslovakia’s path to freedom. It was under President Reagan that the Cold War was brought to a successful and peaceful conclusion. The Soviet Union collapsed taking the rancid ideology of communism with it. The Czechoslovaks, along with hundreds of millions of others in the formerly communist world, were freed. 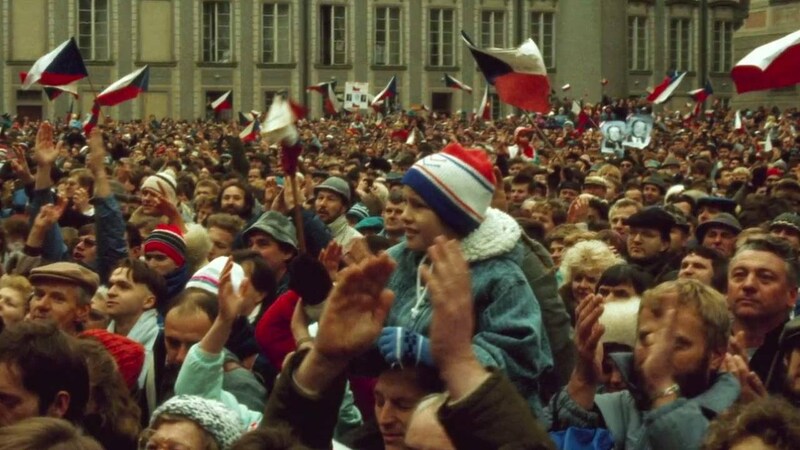 The Czechsoslovaks called the events of 1989 ‘The Velvet Revolution’. In 2011, on the centenary of his birth, the Czechs named a street in Prague in honor of President Reagan. The signs on its walls in Prague are one more legacy of that tumultuous year half a century ago.